On race day my plan is to run between 6:45 and 7:10 per Km and get to 17 Kms in about 2:01 or so. At that point I will encourage the runners still with me to push hard and give it their best to try and finish between 2:25 and 2:29. I will continue at about 7:05 per Km staying with the slowest of the runners who are likely to complete under 2:30. I may need to tweak this strategy once the race route is announced depending on the elevation profile. As always I will keep a watch on the current pace and average pace on my Garmin - average pace of 7:04/Km will result in a 2:29 finish. For those doing their first HM the last 2-3 Kms could be a challenge - both physically and mentally. I hope to egg them on to cross the finish line within the target time. It has not been easy for me to do my training runs at this pace. By consciously running slow I am able to manage a pace of around 6:30 per Km. Am not able to keep it closer to 7 mins per Km pace for too long. The longest I managed at 7 mins per Km pace was 13 Kms in 91 mins on a treadmill. I did a 21.2 Km in 2:22 at an average pace of 6:46 per Km my longest run since end of June. Once I get into the groove I am confident of running between 6:45 and 7:10 pace - in general I tend to run fairly even pace. 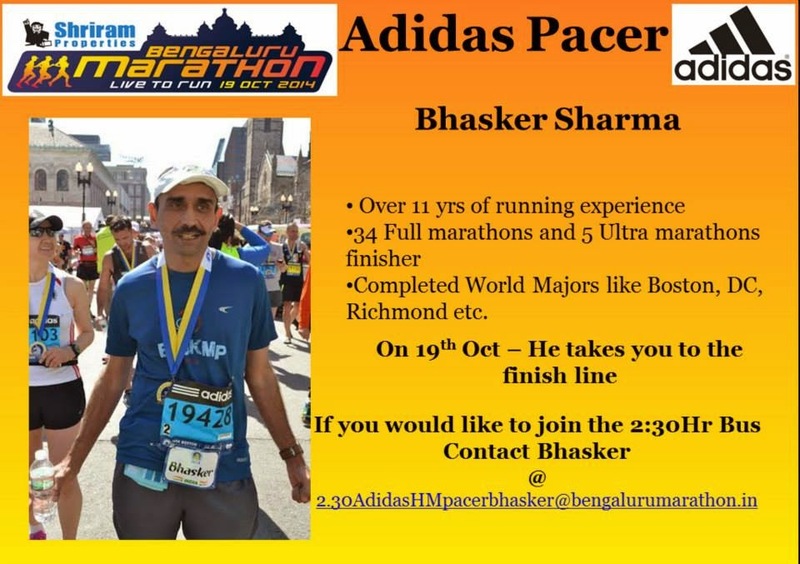 I am eagerly looking forward to helping runners do their longest distance or achieve their personal best and with no time pressure on me hope to have loads of fun doing so! !